I’m a huge fan of chicken wings and I don’t really know anyone who isn’t. I think eating wings satisfies some sort of primal urge we have to rip meat off bones. I truly believe eating wings brings people together. There’s just no way to be civilized when eating wings. Well, I guess you could break out the knife and fork, but the truth is, if you’re down with eating wings with someone, it means you’re cool with being your real self. And my real self has sauce all up on my face, dirty hands and of course, a big smile for whoever I’m eating wings with. You guys totally want to eat chicken wings with me right?! 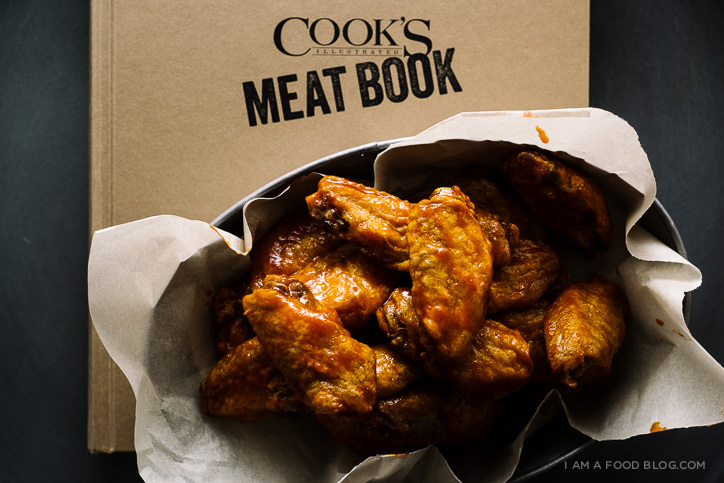 If you don’t, I don’t blame you, but you should definitely make this recipe and eat ALL the wings – either by yourself or with loved ones. Nothing says I love you like chicken wings! These crispy little fellows are from America’s Test Kitchen’s latest, “Meat Book.” It’s full of some amazing meat recipes, but what I like best is how they go into the science of how everything works and why they do the things they do. Like these chicken wings – they’re baked in the oven but are just as crispy as fried thanks to science. Adjust oven racks to upper-middle and lower-middle positions and preheat to 250°F. Set a wire rack into an foil lined rimmed baking sheet. Pat the wings dry with paper towels and place into a large ziplock bag. Combine the baking powder and salt and add to the bag. Seal and toss to evenly coat. Arrange the wings, skin side up, in a single layer on the rack. Bake on the lower rack for 30 minutes and then move the wings to the upper rack. Increase the temperature to 425°F and roast until golden brown and crispy, 40-50 minutes. Rotate the sheet halfway through baking. Remove from the oven and let stand for 5 minutes before transferring to a large bowl and tossing with wing sauce. Enjoy hot. 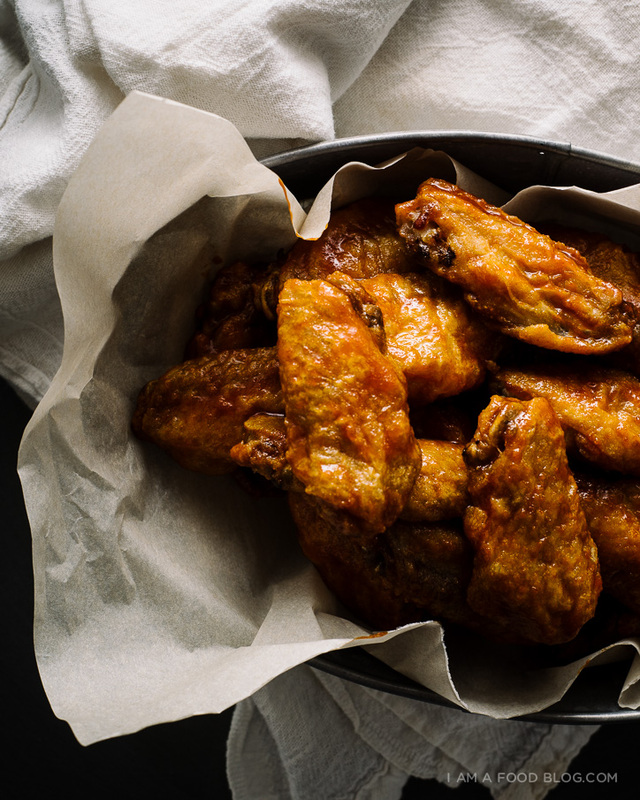 Note: The key to these crispy oven baked wings is the baking power and salt. The salt breaks down the proteins in the skin and the baking powder helps with browning. Starting the wings at a low temperature renders out the fat without overcooking and finishing at a higher temperature crisps and browns the skin. 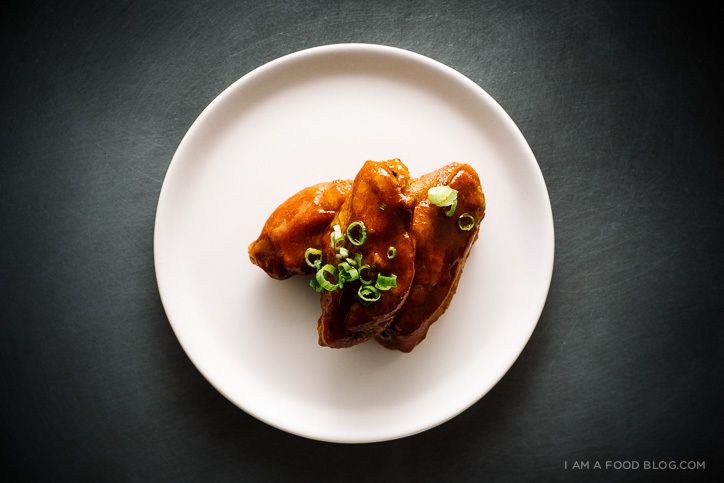 PS – If you need some other wing-spiration, check out these and these! I’ll eat wings with you any day! Also, I love that book cover. The “oven-fried” technique sounds ingenious. You’ve convinced me to try these, even though I’m not a wing person — I was one of those kids who *liked* eating in a civilized manner. Drumsticks, on the other hand, I can handle. This technique healthier than deep frying and not as messy. Will be trying this soon. These sound amazingggg and they look so easy to make! Love this Stephanie! So cute! Yum!! I will eat these chicken wings with you!! Can I please join your wing party? I am SOO excited you posted a baked wings recipe. I have been wanting to bake wings! wingspiration! i wonder how many wings i could eat… these look great steph!! I am absolutely in love with your blog! 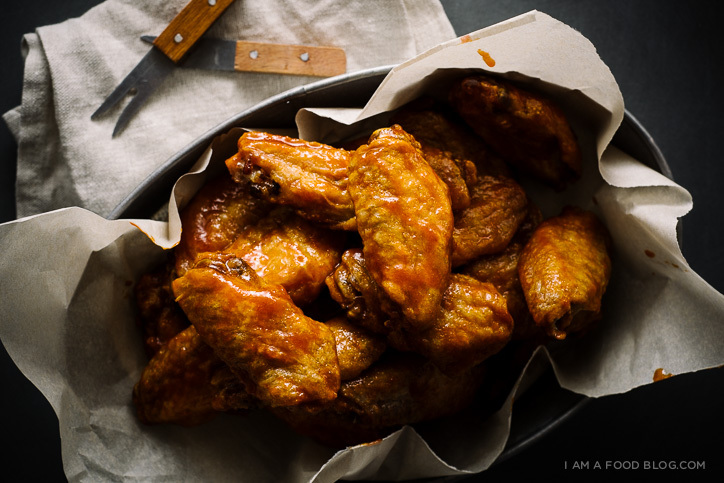 This is an awesome baked wings recipe and I’m looking forward to trying it! ooh. these look crazy delicious, Stephanie! love, love! Are you kidding me, I love chicken wings. Like crazy love. And spicy wings, the best! Wings are totally underrated. Thanks for reviving them! :O Regretting choice to be vegetarian right now. I could do this faux style though but it totally won’t be as good. YUM! Looks amazing! I’m just confused about cooking time. Is it 40-50 total?? Or in addition to the 30min. One seems too short the other too long. Help! I’m dying to try these! it’s in addition to the 30 mins. so bake for 30 mins, move the wings up to the top rack and then bake for another 40-50. it’s a pretty long time in the oven – it helps with the crispiness of the skin! Oh wow this looks so easy! My bf was already begging me to try this. You had me at “sriracha”… I love your blog, well done Stephanie! I made these tonight and was so impressed by how perfectly they cooked. Skin was totally crispy and meat was tender. This is a genius recipe – thanks so much for sharing! these were SO good! made them last night, followed the recipe to a T and they were perfect. so so crispy and delicious and my boyfriend could not believe that they werent fried! Love! I love wings but never want to deal with deep frying. I definitely need to try this technique. My boyfriend and I adapted this recipe for drumsticks last night (kicked the oven temps up a bit for each stage, and extended the cooking time) and they came out absolutely amazing! I’ve never had such tender, fall-off-the-bone drumsticks with such crispy satisfyingly melty skin! Next time we might add in a dash of Tamari to the sauce, and hit the finished product with scallons. A worthy recipe for anyone’s repertoire! I love that you said that wing-eating in front of someone means you are totally comfortable around that person! So profound and totally true. Thanks for the great wings. Just made and finished them off! 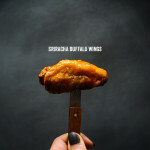 Wicked good sauce, and great way of doing the wings crisp and moist without a deep frier. I also embellished the recipe with PBS’s recipe for Buttermilk Ranch Dressing by Adrianna Adarme (but substituted her 4tbsp sour cream for about 8tbsp greek yogurt). Great accompaniment to some fantastic wings. Next time I might do it the same but add Jasper Hill Farms Bayley-Hazen Blue to the ranch and see where that takes it. I’ve done this twice in two weeks now. It’s simply genius, I will never deep fry a chicken wing ever again! Great simple recipe! I’m a fan of a dry wings with Old Bay seasoning so I replaced the salt with seafood seasoning~ sauce on the side is a must~ accompanied with celery sticks a carrot sticks. I serve Hidden Valley Ranch Dip ( the one made with sour cream and dry mix) along with these delicious crispy wings. And as a added note lightly broil before serving. Love this recipe find!!! 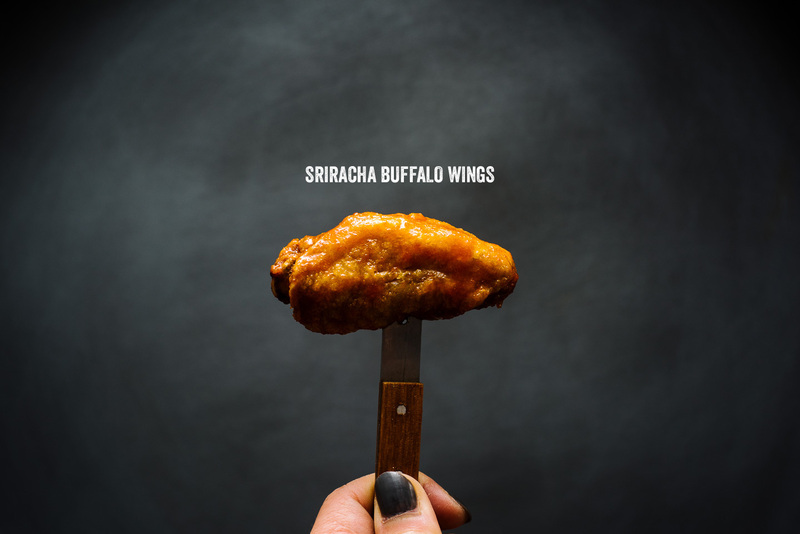 love sriracha buffalo wings. And love your blog! So glad I found this!!.. I used seasoned salt and honey instead of molasses.. Outstanding!.. Holy crap!! These were amazing! Finally crispy oven wings!! Thanks for sharing. You are my hero. Best wings ever. All the baked wings recipes I tried in the past resulted in soggy skin, but finally, crispy wings at home. I’m so happy. So – These did not live up to the hype. I followed the recipe to a T. Adjusted my oven racks, exact ingredients, exact cooking time, and used fresh raw wings. My wings were fall apart – To the point were the bones would easily just come out, leaving just the meat and skin (normally a good thing). However, the skin had a very pastey texture. They were not crispy at all, instead the skin became leathery and chewy. Very unpleasant. I will most certainly reuse the sauce, as it was phenominal – But the cooking method/baking soda did something weird to the skin. I bake alot of wings and have never had anything like this happen. My advice, skip the baking soda – Season and bake at 425 for 50-ish mins on a lined tray. bryan, you said you used baking SODA but the ingredient calls for baking POWDER! they are two VERY different things! Again, that being said – I used the sauce again today for my Superbowl wings (Go Pats!) – And everyone raved about the flavor. Just made these…….absolutely delicious! Love your recipes! how would you adjust the time for less wings? or keep the same time? i would keep it the same. Made love to these tonight. Thank you for sharing your genius with the rest of us. Can you do a straight substitute of the molasses with honey? I think honey would work well! I felt that my wings had a little powdery texture in my mouth. Can that happen if you use too much baking powder? I haven’t had a problem with it – how many wings did you have in your 3 1/2 pounds of wings? Does this recipe use frozen or thawed wings? the wings are fresh! thawed wings will work. Is there anyway to prepare it for the next day’s meal? I want to bring it to work for my colleagues to try but can’t deal with the long baking time in the morning before heading to the office. Was thinking either to bake it for 30mins the second step, and do a 10-15mins the next day to keep it nice and crisp and still slightly juicy. If I cook it through the first day, next day when I heat it up in the toaster it’d still be crispy but probably too dry. Any suggestions? to be honest, i don’t think it’s possible to separate the cooking steps. the baking powder’s job is to draw out moisture, so if you coat the wings the night before and par-bake them, the baking powder will most likely be drawing out moisture all night.